Great parcel with 40 acres just minutes from downtown Casper. More photos to come shortly of the topography and views. Great Location!! High Traffic location, showroom, office, shop with two overhead doors, additional parking if needed. 3100 sq. ft. with 1 office and bath. Fenced yard with 2 equipment sheds. (2) 12 ft. overhead doors with openers. Stunning location for your future business, with great traffic visibility. Zoned commercial, with tremendous opportunity. Great views 1.77 fenced Acres close to city limits. Call Frank for showing 307-267-8009. Browse Homes for Sale - Looking to buy a home in Casper, WY? Look no further! Our website offers the most up to date information for real estate for sale in Casper, WY. As always, feel free to call us at 307-462-1985 with any questions! 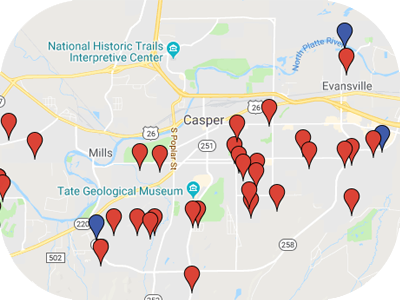 We would be happy to schedule a showing appointment for you on any home in Casper!